Yes, it was named after the potty-mouthed chef – The F-word… Yes, that one. Spoken in response to my 40m Linear-Loaded Dipole deciding to shift frequency slightly and require a slight prune on 2 separate occasions. So, The F-word can also mean frequency. Yes, that’s much more pleasant. 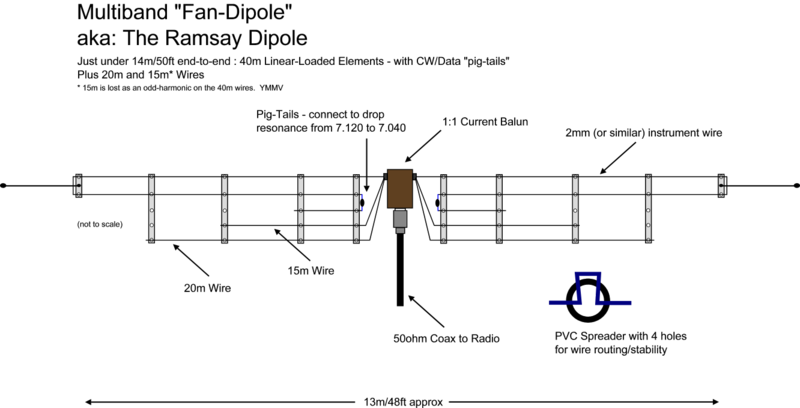 So, with that in mind – Here’s a description of a simple multiband “fan” dipole that fits in a 14m/50ft garden and can work 40m through 10m. 40m Linear-Loaded (around 12m each) with 30cm “pig-tails” – I can lower the antenna, twist these wires together and enjoy resonance at around 7.040 rather than 7.130MHz. Great for CW and digimodes. The 15m wires are there because the 40m wires do not present a significant dip as an odd-harmonic. The above combination gives me under 3:1 VSWR on 40m, 20m, 15m, and 12m. A little bit of help from my MFJ-948 is required on 17m+10m. 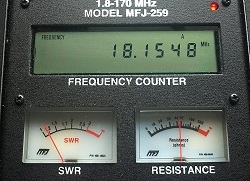 Because I’ve added a resonant 20m dipole, the previous 17m null is now at 16.8MHz. Update 6th March 2014 : After some tests with a 2nd version, I have managed to improve the reliability of the SWR – quite simply: longer PVC spreaders! From a few experiments with this new version about 10ft off the ground, I found that you need to keep the other band wires as far away from the 40m return wire as possible. I’ll update this article “properly” soon, but the short answer seems to be keep your spreaders as long as possible! I dislike using an ATU – Not only because it’s frustrating when changing bands to have to re-adjust everything, but it’s hardly an efficient way of getting your signal up and away – My objective was to be resonant on several HF bands, particularly 40m, 20m and 17m. I like 40m, and I didn’t want to lose the ability to just switch-on and operate – So I wanted to keep the linear-loaded 40m wires and add wires for the higher bands. Initial tests with 20m/17m/15m wires gave me a washing line (ie: not much of an aerial), so I removed the 17m+15m wires. Perfection! I ended-up with a perfect match at 7.125, 14.100 and 18.155. The SWR creeps up a bit on 20m but is within 3:1 for the whole band so the internal ATU on the FT-950 is able to keep things “respectable”. 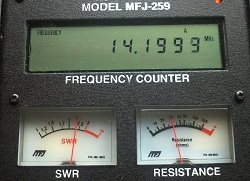 The 17m resonance is very narrow, about 50KHz, and typically gets you onto the SSB section of the band. The wires are held in place via a series of PVC “spreaders” – Each one is made from 22mm conduit trunking that has 5-sets of 4 holes, 40mm apart. These allow the wire to thread in, out, back in and out of the tube (think Omega symbol), holes at 9, 11, 1 and 3 o’clock. This arrangement keeps the wires tensioned and prevents any interaction between them which would cause the resonance to alter drastically. It is advised to keep the 20m+15m wires as far from the 40m pair as much as possible – I have had little success with adding a 10m dipole to this arrangement: I suspect a longer set of spreaders would be required. YMMV. The 40m wires are actually longer than half-wavelength, they are around 12m rather than the “on-paper” value of about 10.5m. This re-enforces the wisdom of making your initial wires longer than they need to be – It’s easier to prune than it is to extend! Because of the folded arrangement of the 40m wires, it doesn’t work on 15m so I need to either increase the length of the spreaders to give the wires more breathing space, or get a bigger garden! The spacing between the 40m wires is 40mm on the spreader, with the 20m wires 80mm from the “return leg” of the 40m wire. Shown below is one-half of the dipole with a typical 1:1 balun – I am using a Diamond BU-50, but an M0CVO or Watson model will suffice. The image shown above has the 40m linear-loaded wire plus 20m+15m wires – The overall length of this aerial is 12m. If you have a longer garden, you can move the pig-tail join further back the return wire. This dipole was built to replace my single-band 40m Linear-Loaded Dipole. You could also use it as a sloper or in an Inverted-V formation if you have limited space. The balun used is a Diamond BU-50 – I’ve yet to try this aerial without one, and I like to err on the side of caution. 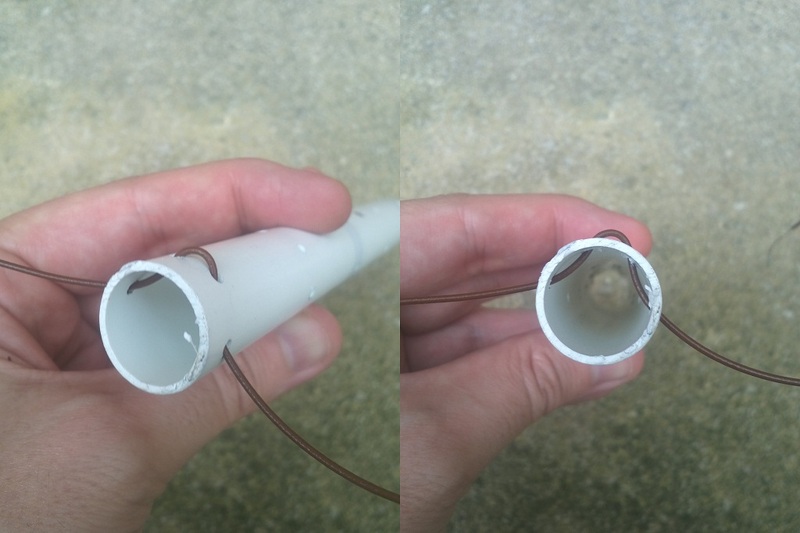 Below is my method of keeping wires fixed when using PVC spreaders – Simply drill 4 holes: A pair straight through and then 2 in-between. The wire is then threaded through to form an Omega symbol. When testing+tuning, you can start with just the 40m wires – Aim for about 7.125-150MHz as the sweet-spot. Once you’re happy, add the 20m and 15m wires and continue tuning – Adding more wires will bring down the 40m resonance a bit. Does it work? Check my Online Logbook – Every HF QSO from 11th July 2012 onwards that says “Loaded Dipole” or “Dipole” was made using this aerial. For some bedtime reading on the subject of multi-band “fan” dipoles – This article on Ham Universe is worth a look.